What is Maryland Rye Whiskey? We wanted to take a minute to address one of the most asked questions we get at the distillery; what is Maryland Rye? A large part of why we started our distillery was to explore and develop the incredible heritage and history of distilling here in our wonderful state as native Marylanders we love to parse what it is that makes Maryland Rye so special. This is part science, part history and part philosophy so I hope you will bear with us while we take a deep dive into Maryland Rye Whiskey. We have been interviewed by several magazines, newspapers, bloggers and aficionados about Maryland-Style Rye whiskey and it inevitably ends up devolving into percentages and mash bills. The overarching theory on what separated Maryland-Rye from Pennsylvania Monongahela Rye is fairly straightforward, Pennsylvania Rye is typically made from 100% rye mash bill, whereas Maryland Rye is likely finished with something else (barley, wheat, corn or some combination thereof). There is no “prototypical”Maryland mash bill beyond that. There is evidence of barley finishes around Baltimore, corn finishes on the shore and wheat finishes in Western Maryland. Even within a single town, multiple distilleries very likely used completely different mash bills based on how they started and what was currently available (look at Burkittsville as a great example). However, part of what we preach here at McClintock is that looking at mash bills alone is just scratching the surface of what a whiskey is. If you look at whiskey as a finished product, the grain mixture is simply the building blocks for the complexity, depth, aroma and all around wonderful chemical components that make whiskey such a special spirit. Not to discount the importance of choosing grains. You can’t manipulate or enhance components that are not there, but looking at a whiskey as an amalgamation of 75% rye and 25% barley you will never get the whole picture. We argue, rather, that by looking at Rye as Rye you are missing out on what made Maryland whiskey special. There are hundreds of varietals of wheat, rye and corn and even if you are growing the same varietals under different soil, water and light conditions you are going to have a natural variance in composition. We believe that a large part of the legacy, history and taste of Maryland Rye comes directly from the varietals that people were growing here and the environmental conditions on which they were being grown. After all, the reason we became a hotbed of Rye whiskey in the first place hundreds of years ago was because early settlers couldn’t grow barley for traditional European whiskys so they substituted in a native rye that grew great in our clay-heavy rocky soil. We have put painstaking effort into recreating a “traditional” Maryland-Style Rye whiskey by using these heritage grains and using historical milling techniques with our Stone Burr Mill to keep the temperature of the grain cool to preserve the beautiful complexities of the grain intact. Processing plays just a big a role in the flavor development of the whiskey. If you are using high-friction mills and material handling methods you burn off all of the light and aromatic flavors that our forefathers did such a great job preserving. The final component of what our amazing home-state can provide that nothing else can is our barrel resting conditions. Distilling icon Hubert Germain-Robin once said that “The aging process obeys the cycle of life, and it is influenced by the changes of the season, the moon, the environment, and all natural and local conditions.” Everything from the flora in the air, the humidity, to the temperature of the rickhouse plays a drastic role in the flavor extraction of the beautiful wood components in the whiskey, and nowhere else in the world has the conditions we have here in Maryland. Put this all together and you have a perfect storm of Rye Whiskey. There are so many examples of amazing Maryland Rye Whiskey being produced now in the Free State and we are proud to be a part of the movement to restore the beautiful heritage and history of Distilling Maryland Rye Whiskey. We are absolutely thrilled to announce that McClintock Distilling won the double gold medal for our Reserve Gin at the ninth annual New York International Spirits Competition. 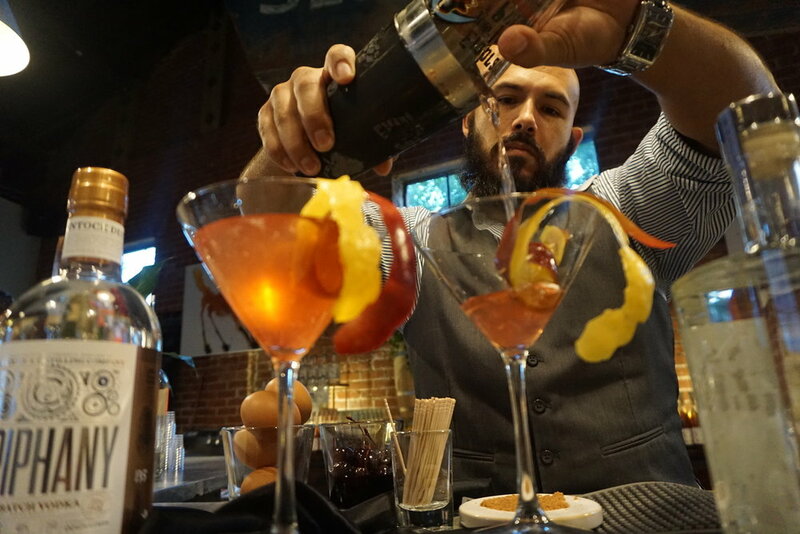 The 2018 competition featured spirits from more than 29 countries and 60 categories. More than 600 spirits from around the globe were submitted to the competition and judged in a blind taste test by top industry buyers. We were one of only two distilleries worldwide to be awarded double gold for gin. McClintock was also named Maryland Gin Distillery of the Year and was awarded a bronze medal for our Maryland Heritage White Whiskey. We knew there would be stiff competition this year and we’re humbled to receive this honor and be distinguished among such a diverse and impressive group of spirits. The Reserve Gin is the first American gin to be aged in a used cognac barrels imported from France. 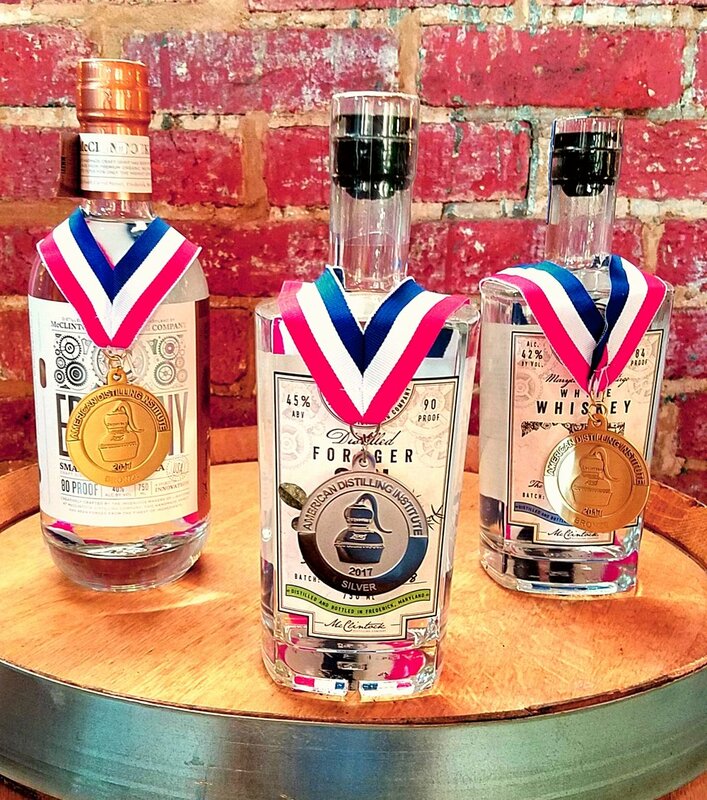 We are also proud to have received silver medals for our Reserve Gin, Forager Gin, and Epiphany Vodka at the 2018 San Francisco World Spirits competition and silver medals for our Vodka and Maryland-Heritage White Whiskey at the American Distilling Institute Judging. If you haven't had a chance to come in and try the reserve gin, you can book a tour and tasting to try for yourself, or you can ship it from some of our partners. As always we want to thank all of you for supporting our distillery. We wouldn't have been able to start this business without the amazing support of the community here and we really appreciate all of your help! Announcing the First Annual PROPER Holiday Cocktail Ball! McClintock is teaming up with PROPER Bartender to bring in some of the best bartenders in the DMV for a night to remember (that also supports two great causes!). We are getting in the holiday spirit here at McClintock Distilling and putting together a very special evening to celebrate the holidays on December 8th. We are hosting an elegant cocktail ball to benefit The American Cancer Society and Toys for Tots. Tickets can be found here and we still have a few early bird tickets that will only be on sale until the end of the week! Tickets are going very fast and we have limited space available so be sure to snag some before we sell out! Fabian Rafael, the owner of PROPER Barntender mixing up some amazing cocktails you can taste at the PROPER Holiday Cocktail Ball. We are also holding a donation raffle for a chance to win a VIP package for the ball, an at-home PROPER bartender experience, McClintock Spirits and much more. Proceeds will go to benefit our two non-profits and is a great way to support The ACS and Toys for Tots in time for the holidays! So get your fanciest cocktail attire out, put your dancing shoes on and prepare to enjoy some of the most delectable cocktails prepared by 11 of the finest hand-selected bartenders from the DMV area. Live music and fine local food to be provided as well. You can check out the event on facebook as well to stay in the loop for any updates as we get closer to December 8th. McClintock Distilling Presents Films & Fermented Foods Night! McClintock Distilling has teamed up with The Frederick Film & Music Festival Non Profit Organization as well as The Sweet Farm Food Truck to bring to you a hump day pick me up. Socialize, network and help raise money for The Frederick Film & Music Festival and their upcoming special events. Who doesn't love great local food and great movies? For our first Films & Fermented Foods Night, Rachel from The Sweet Farm will be providing guests with a delicious sausage, pickle, full saurkraut bar and a ginger beer made with used raw materials from our Forager Gin ;) then after all that settles you can enjoy a beer or 5, sit back relax and watch Black Dynamite! "He's Super Cool and He Knows Kung-Fu!" 2 pairs of free tickets to this years Frederick Film & Music Festival. Beer & Wine will be available throughout the night. Subscribe to the event on Facebook for updates! We are so proud to announce that we won medals for all 3 of our spirits at the American Distilling Institute Annual Craft Spirits Judging for this year. Our Forager Gin won a silver medal and both the Maryland-Heritage White Whiskey and the Epiphany Vodka won bronzes. The awards were presented as a part of the ADI conference held in Baltimore this year and was attended by over 1,600 people. This is our first competition and we are proud to represent Frederick and Maryland among spirits from all over the world. The competition was entered by hundreds of distilleries and thousands of spirits this year. In their respective categories, our Forager Gin placed in the top 8 in the country, our Epiphany Vodka placed in the Top 10 in the country, and our Maryland-Heritage White Whiskey placed in the top 10 in the country. Our award winning spirits; Forager Gin, Epiphany Vodka and Maryland-Heritage White Whiskey. The 2017 ADI awards were open to Independently-owned American and International craft distillers, blenders, bitters makers, and producers of aperitifs & fortified wines. The judging panel was composed of 32 distillers, journalists, bar owners, bartenders, retailer, wholesalers, distributors and importers from across the world. All tasting was done blind under a strict set of protocols set by the American Distilling Institute. We are honored to have participated this year and look forward to sharing some of our newest spirits with you all in the next few months! We could not be more excited to announce that we will be officially opening our doors on December 3rd! As a token of our appreciation to all of our patient supporters, we are providing free tours and tastings to all our friends who stop by from noon to 8pm on December 3rd and 4th. Stop by and taste our Maryland-Heritage White Whiskey, Epiphany Vodka, and Forager Gin. Bottles and new new McClintock gear will be available for purchase in the tasting room. View from the production floor into the tasting room. After a long 14 months of construction and a lot of help from family and friends, we have finished transforming our 105-year-old former- garage into a state of the art distillery and tasting room. We have fully modernized and transformed the space while highlighting and preserving the classic and historic aesthetic of the building. Keep an eye on our social media over the next few weeks as we countdown to opening our doors featuring pictures from the last few months. We started working on this business over 4 years ago and still can’t believe it has become a reality. We would like to thank all of our family, friends, co-workers and fans that have helped us along the way. Making craft spirits is a passion for us and we can’t wait to share what we have been working on with all of you. See you in a couple weeks and cheers! And other updates served on the rocks. We are excited to give our McClintock family a first look at our third announced core product: Epiphany Vodka. Epiphany joins our Forager Gin and Maryland-Heritage White Whiskey as the initial spirits that will be available for our launch. We are fortunate to be working with the local design mavens at Tribe Design who have done amazing work with Monocacy Brewery and Old Bust Head Brewing Company, among others. Take an exclusive first look at the Epiphany label below with our other products. In other news from the distillery, we are getting tantalizingly close to opening our doors to you fine folks. Since we last posted, we have made huge progress renovating our 100 year old building. We have brand new concrete floors, new plumbing and have framed out our new walls. Here’s a sneak peek at the production floor coming along. Quick look at the production floor. Pictured are the lab, office space and storage. We are excited to be bringing you hand-made craft spirits soon and keep an eye out for a big announcement in the next few weeks. Thank you all for supporting McClintock Distilling and we look forward to having you in the shop very soon! We were very proud to represent the great state of Maryland as one of the 11 final businesses selected from across the country for the Small Business Development Center showcase on Capitol Hill last week. We’ve worked closely with the Western Maryland SBDC preparing our business for the last two years and were honored to have been selected to showcase the great work we have done together. Members of Congress and their staff stopped by our showcase to learn more about our growing business and the contribution we hope to make to the community. The reception we received was incredible! We are thrilled to hear people from all over the country are interested in organic, hand-crafted spirits produced in a sustainable distillery. We are itching to get distilling and be sure to follow our Facebook, Twitter and Instagram for a BIG announcement about our opening in the following weeks. In other exciting news, we have banded together with Frederick-area distilleries to create the Frederick Distilleries Network. Our collective goal is to attract people from across the country to Maryland to experience the Frederick Distillery Trail, a unique offering that will take visitors on a tour through the local distilleries, with each location providing a different perspective on producing spirits. Read more about the Frederick Distillery Network here. We would like to personally thank Brandon Mason and Dianne McFarland from the SBDC for all the help they have given us in starting this business and the great community of residents and business owners from Frederick for embracing McClintock Distilling. Our goal from the outset was to be a community-minded business and we are very thankful for the warm reception. We hope you had a great 2015 and are looking forward to an even better 2016. We have a few updates from the distillery that we couldn’t wait to tell you about. Get your McClintock shirts hot off the presses. We have launched our online store where you can find shirts, gift certificates, shot glasses and much more. Be one of the first people to support McClintock through the online store and receive a free tour and tasting with every order. Our Distillery is powered by the wind and sun! We have partnered with renewable energy supplier Ethical Electric to source our electricity from wind and solar. McClintock Distilling is one of the first Distilleries to buy wind-powered energy and we continue to innovate the industry with sustainable practices. Our business is not only about dollars and cents but also about our commitment to the community and the environment. McClintock Distilling is now a part of the Downtown Frederick Partnership, which connects local businesses to the public. We are thrilled to be associated with the partnership and are looking forward to many great events in the year to come. We are proud to offer our event space to non-profits and businesses as well as private events and weddings. If you are interested in booking something for later this year check out our event page. We hope you all had a great 2015 and we are looking forward to seeing everyone at the distillery in 2016. As always, you can check out our progress on our Twitter, Instagram and Facebook. As the renovations on our historic building continue, we have some exciting updates from the distillery and a chance to win a free tour and tasting. Our equipment has arrived! After 14 months of waiting, our hand-made 264 gallon copper still has arrived, as well as our fermenters, mash tun, and some other distillery essentials. We are particularly thrilled about the gin basket, which will allow us to infuse our gin while the alcohol is in vapor form for a clean taste with a crisp finish. Ryder the Distillery Dog poses with our still and whiskey helmet. We will announce the winners on December 4th and if your name wins, you will receive two tickets for a tour, tasting and a free McClintock t-shirt! In other exciting news, we spent time this month working with the head distillers at Koval Distillery in Chicago. We also dialed in our whiskey mash and gin botanical mix and will be ready to run very soon. You can see photos of our distillers hard at work on our Facebook, Instagram and Twitter. As a family owned distillery, we would like to wish you a happy Thanksgiving from our family to yours. We are thankful for the support of our followers and those in the community to have this chance to bring hand-made spirits back to Maryland. · We are excited to have received word that our 264 gallon handmade copper pot still is aboard the Chicago Express and sailing this way. We placed the order for our still over 14 months ago and have been waiting impatiently ever since. You can track our still in real time at MarineTraffic.com! · McClintock Distilling has been profiled by Frederick Magazine and the annual edition of Crave Magazine. Pick up a copy of the October edition to read more about our plans for the distillery by the creek. We are looking forward to contributing to the amazing food and beverage culture of our town. · The restoration of our 100 year old building is coming along one brick at a time. We are painstakingly power washing layers of latex paint off the interior walls exposing beautiful brick that has not seen the light of day in over a century. · We had a great time at In The Street this year. Thank you to all who visited our booth on Market Street and to Celebrate Frederick for inviting us to this year. Congratulations to the winners of our t-shirt raffle. If you want to win McClintock gear, keep an eye out on our Facebook, Twitter and Instagram for more contests coming soon. McClintock will be using high quality, locally grown, organic grains to produce our spirits. With fall quickly approaching, McClintock Distilling is spending some time visiting area farmers to ensure we procure the best Maryland-grown grains to make our spirits. 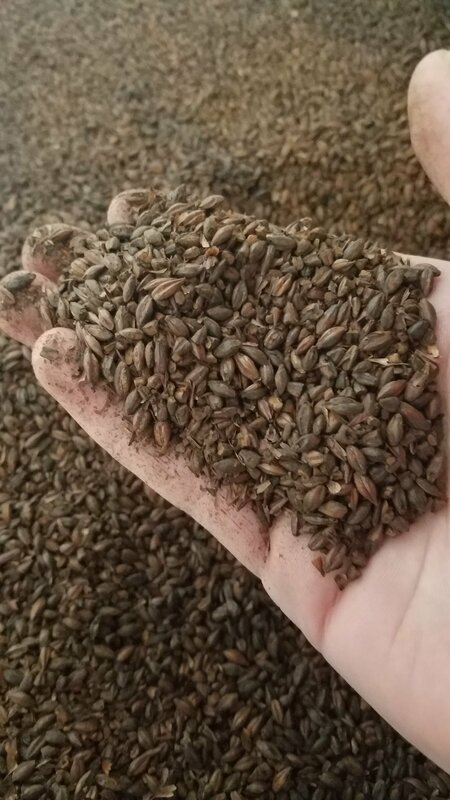 We are dedicated to buying organic, high quality grains from western Maryland farms to support local farmers and cut down on the distillery’s environmental impact. We are very excited to be working with Maryland Farmers and the Frederick County Agricultural liaison to bring you the finest gin and whiskey soon. We are also working on partnerships with several dairy farms to recycle our spent mash. All of our organic waste will be re-used by these farmers as livestock feed to eliminate solid waste from the distillery. Our mash produces quality feed that is high in nutrient content and also gives the animals a nice buzz! McClintock Distilling was also featured in the Baltimore City Paper last week as part of a story on the rise of Maryland distilling. It’s a great read about the return of a once prominent industry in the Old-Line State that we are happy to be a part of. Keep checking back with us on Facebook, Twitter, and Instagram for updates on our progress and we look forward to having you all in our distillery soon! · McClintock Distilling is now officially a member of the Maryland Distiller’s Guild and joins a host of great distillers with the common goal of bringing quality spirits back to the state. We are looking forward to working with the guild and other distilleries to promote Maryland-made spirits across the country. · We are working closely with architect George Harne and the City of Frederick to ensure that the character and history of the building is kept intact, while also pursuing state-of-the-art facilities for our customers to enjoy. We have discovered a bunch of welcome surprises in the renovation process; including five beautiful windows with antique hand-crafted glass that had previously been covered. · If you didn’t get a copy of Saturday’s Frederick News Post, McClintock Distilling was featured on the front page. We have also been getting great coverage from The City Economic Development Blog and national coverage from BevNet, a source for the beverage industry. We’ll be back with more updates on the distillery’s progress, but in the meantime, check out our Facebook, Twitter and Instagram accounts for time-lapse videos, photos and up-to-the-minute updates. It’s official, we have signed a lease and are ready to start retrofitting our building for the distillery! We are so excited to get started on this project after years in the making and thankful for everyone who was a part of our process. McClintock Distillery’s new home is 35 South Carroll Street, centrally located in downtown Frederick. As construction commences and we eagerly await the arrival of our equipment, we’ll be posting to the blog with updates and news on the distillery’s progress. After meeting with seasoned distillers across the country, as well as many Frederick-based businesses and local leaders, we are eager to get down to business and start making spirits. We have also been meeting with many local farmers in order to secure the highest quality, locally grown, organic grains as a base for our products. McClintock Distilling is dedicated to using Maryland-grown grains to process authentic Maryland spirits. By minimizing distance traveled, we will be cutting down on carbon emissions from shipping and helping to support small, family-owned Maryland farms. Take a look around our newly launched website and be sure to like and follow us on Facebook, Instagram and Twitter to get the latest updates from the McClintock Distillery. Also, please sign up for our newsletter for exclusive deals and offers and be one of the first to have access to our products and tours. We’ll be keeping you posted on our progress so check back in soon. For any further information about the distillery please contact Braeden Bumpers at braeden@mclintockdistilling.com or 202-557-9914.